Unlike leaflets, pamphlets and newspaper ads, custom promotional products offer longer-lasting advertising advantages. That is why marketers put much effort in creating marketing merchandise that customers will use. Below are products from Starbucks. These products are for retail and are definitely worth collecting. Various merchandise are on display such as plush toys, custom ceramic mugs, custom shape plates, mugs and saucers sets, pitcher, as well as bags. Plushies: Stuffed toys target huge demographics- kids, adults, women and even men. Customers can display or collect these items, which means every day brand exposure without the additional cost. If you are looking to retail plushies, then you will need certified tests to ensure that your merchandise meets international safety standards. This blog discusses what you need to know prior to manufacturing your own plushies for retail. 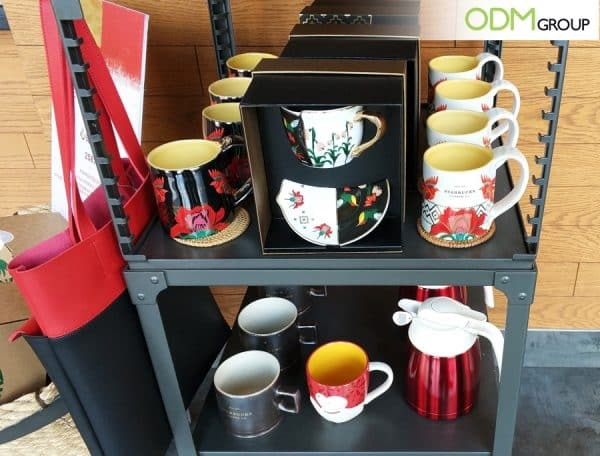 Custom Ceramic Mugs with Unique Handles, Cup & Saucer Set and Pitcher: Starbucks offer a wide array of vibrant custom mugs and pitcher. These items are among marketers’ favorite promo tool because they are flexible and work great in different promotional projects. They are ideal for information dissemination campaigns since they are highly customizable. The brand gets greater exposure every time customers see their logo on their mugs and pitcher. Check out the blog below to see some insanely creative design ideas. This cup and saucer combo was used as a gift with purchase from Kikki-K, a stationery shop. This shows the flexibility of drinking cups and mugs. 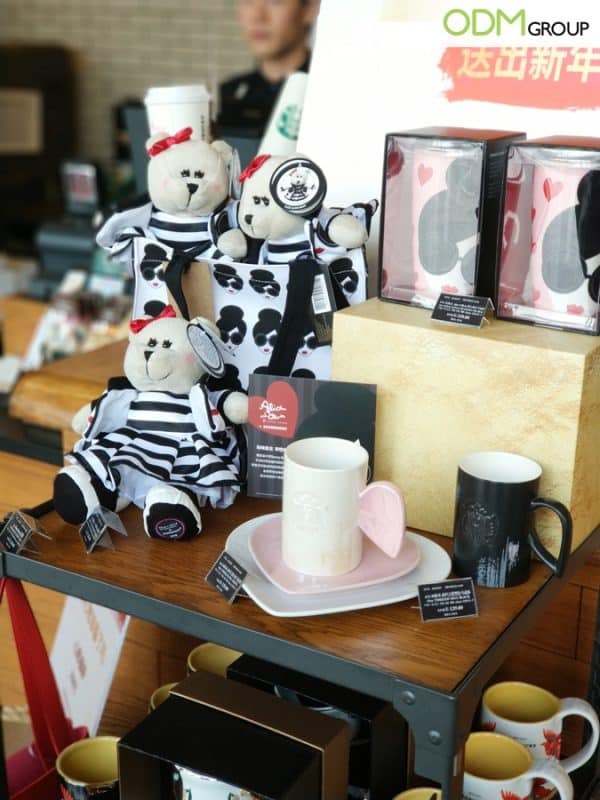 We love how how Starbucks’ merchandise resonates with their brand message and image. Because they are useful, they can inspire instant brand recognition in the long run. Most importantly, using custom promotional products can forge stronger customer loyalty. This translates to increased sales and repeat purchase. Placing their POS display unit near the counter also helped get the attention of the customers. This entices the customer to purchase any of the merchandise before they leave. Do you need help with your next project? Contact ODM today. If you want to know more about our services or previous projects check out our case studies. Below are some related articles to kickstart your marketing project. These promotional sleeves for coffee not only protect hands from getting scalded, but they also serve as a simple marketing device. Thinking of setting up your own coffee shop? Here’s everything you need to know prior to starting up your coffee business.